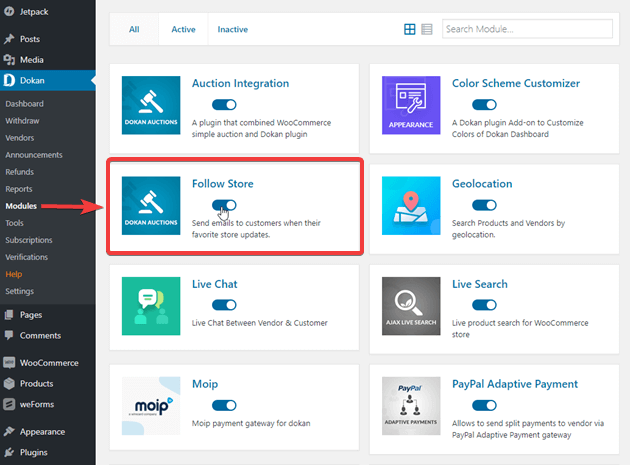 Follow Store is the new module Dokan has introduced. This module enabled the option for customers to follow the vendors whose products they like and want to stay updated with. They can follow multiple vendors according to their interest. Your customers will get updates and emails about vendors newly added products. Let's see how it works. Toggle the button to activate it. 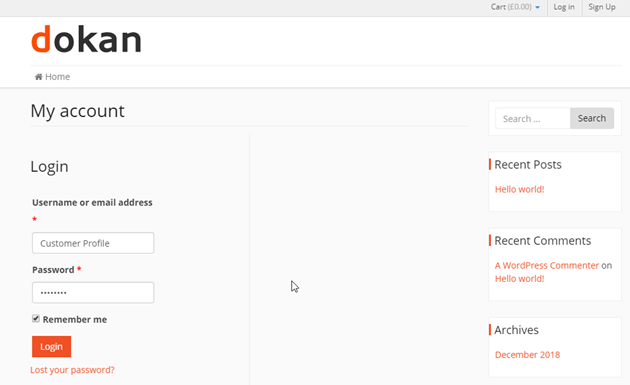 When you activate this module, in the frontend dashboard of a vendor, an option of “Followers” will show automatically. 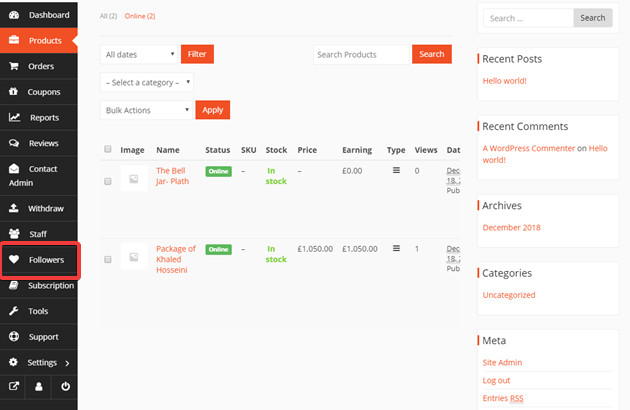 Now your marketplace customers can follow the vendors going to Vendors page when they log in. To get to the vendor store list page, a customer will have to navigate through Customer Dashboard → Vendors. 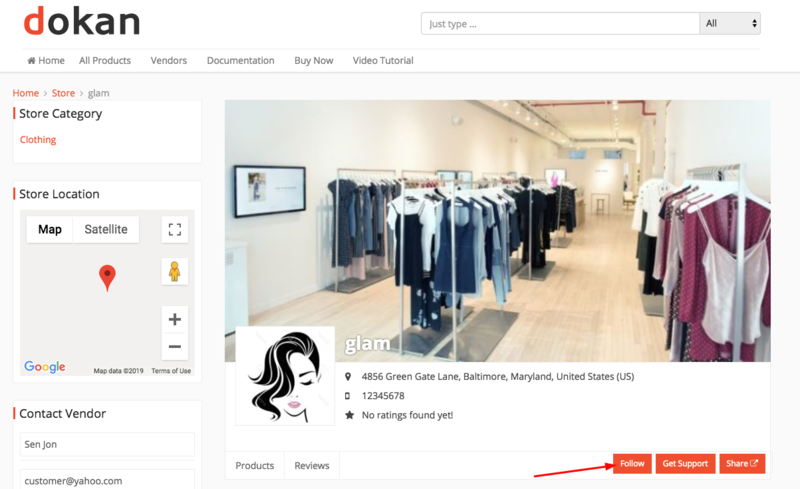 Clicking on it will let the customer enter the vendor store list page. From here the customer will get to view the list of all the active vendor store where they will see a new Follow button under each store in the vendor listing page. Now any customer can simply click on the Follow button to follow any particular or all vendor store from here. The customer can also follow a specific store by visiting a vendor store separately. For that, they would simply need to click on Visit Store tab and then click on Follow. To check out the followed vendor store list, the customer will need to log in to the account and navigate through Customer Dashboard→My Account→Vendors. 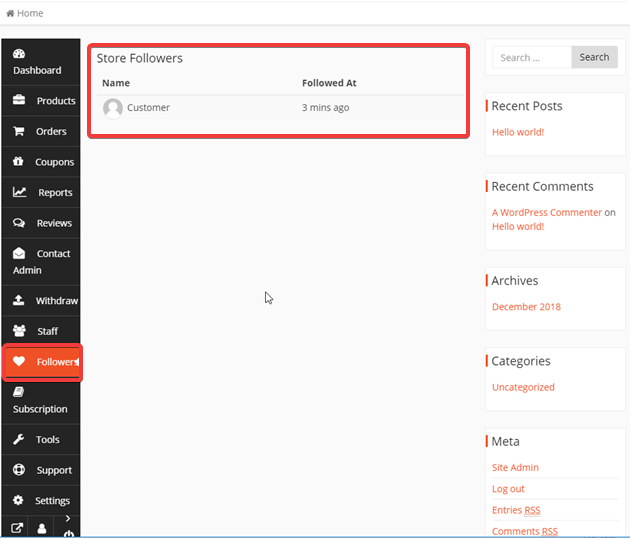 Clicking on Vendors tab will take the customers to their followed vendor stores list page as seen below. 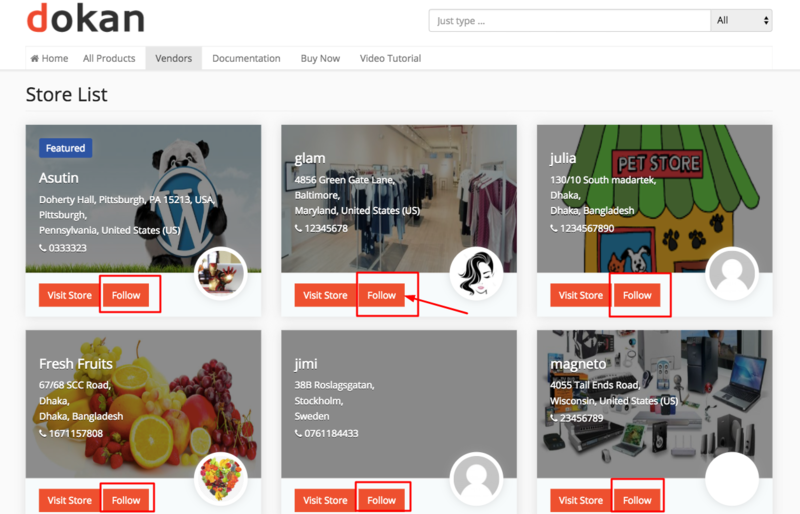 Now when a customer follows a specific vendor from your marketplace it will automatically show in the “Follower” section of frontend dashboard for that vendor. To get to the Follower tab to view the details of the followed customer, the vendor would need to navigate through the My Account→Vendor Dashboard→Follower. Vendors will be able to see the name and the time when that customer has followed them. Note: You won't get emails every time a vendor uploads a product in their store rather they will be notified in one mail that the vendors they follow have stored new products in their store.